I’m going to be honest. This recipe initially started as actual salad rolls. I’d volunteered to make them as an appetizer for a dinner with lady friends. Obviously, I terribly underestimated how long they’d take to prepare. So there I was, at home, rolling rice paper furiously...when what I really should have been doing was putting on a half decent outfit and heading out the door. Long story short, I ended up rolling into dinner 30 minutes late (sorry, couldn’t help myself). The dish was a real hit; but still, I knew there had to be an easier way. Deconstructed spring roll salads/bowls are by no means revolutionary. But they are a great way to assemble a delicious meal in a fraction of the time. You still get all the goodness of the fillings, without the fuss. The only thing you’re missing are the rice wraps, which to be honest, I think you can live without. Sure, having individual rolls makes for a cute hand-held eating experience; but sadly they don’t keep well in the fridge, because the rice wraps will get chewy over time. 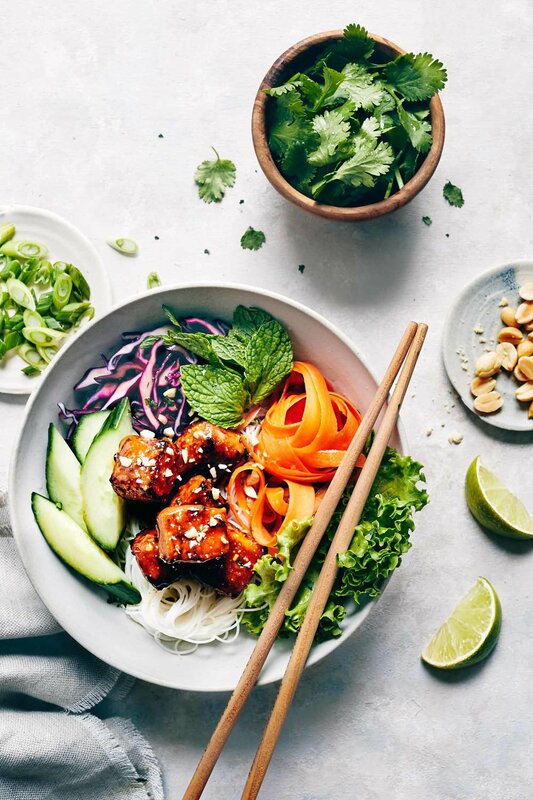 By ditching them altogether, your Vegan Spring Roll Salad becomes a much better contender for tasty leftovers the next day. 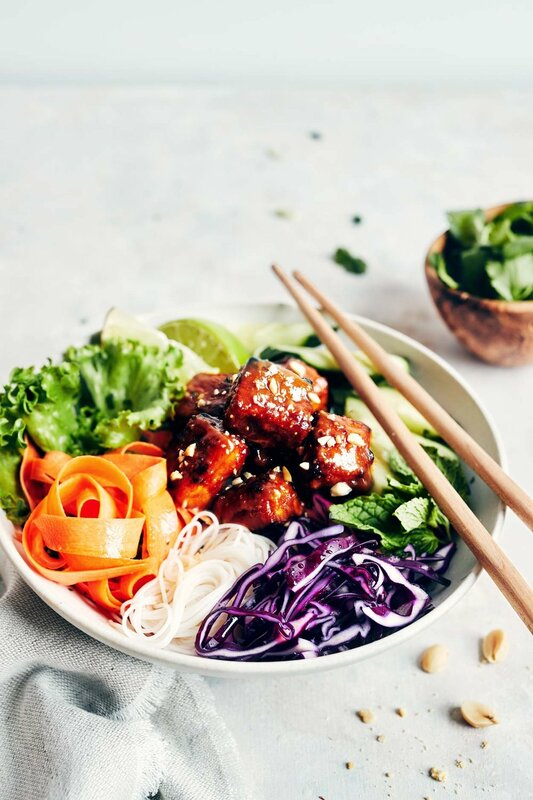 While Vietnamese rolls are often served with either a vinegar-based sauce or a creamy peanut version, I found a way to use both. Both are delicious, so why choose one?! First is the easy, finger-licking-good peanut butter sauce that hugs the cubes of oven baked tofu. The creamy sauce is a pinch to whip up, and it’s loaded with all the nutty, salty, and sweet flavor you could want. A thin layer of cornstarch (or arrowroot), gives the tofu a light coating that the sauce can stick to - no oil required. It’s addictive, and just might happen to be my favorite baked tofu to date. Then, for the noodles, I choose to toss them in a tangy ginger lime vinaigrette. The vinaigrette not only gives an extra boost of flavor, without feeling heavy, but it’s also a better method for storing extra noodles overnight. A thick peanut-based sauce will tend congeal in the fridge, causing your noodles to stick together into a brown blob, which unfortunately doesn’t make for the cutest office lunch situation. So do yourself a favor and hop on the double-sauce train, because the combination is delicious! As for the rest of the bowl, all you need are some crisp veggies, fresh herbs, and chopped peanuts for a bit of crunch. We use carrots, cucumber and shaved red cabbage in our version, because that’s what we usually have on hand. You can substitute to adapt to what you have in the fridge, but definitely opt for something crunchy. The fresh herbs are an absolute must, since they’re a key ingredient to real deal spring rolls. Roughly chopped peanuts are totally optional for sprinkling on top of the dish. If you’re avoiding peanuts altogether, you could substitute the peanut butter in the sauce for almond butter instead. Preheat oven to 425°F. Line a baking sheet with parchment paper. Cut tofu into ¾”-1” cubes. Transfer tofu cubes into a medium-sized bowl, add 1 teaspoon tamari and then gently use your hands to toss. Add cornstarch. Again, use your hands to toss the tofu. Once the tofu is evenly coated (cornstarch should no longer be visible), spread cubes out on baking sheet. Bake for 15 minutes. While the tofu cooks, make the peanut sauce. In a clean medium-sized bowl, add peanut butter, 1 tablespoon tamari, lime juice, coconut sugar, Sriracha, and garlic powder. Stir vigorously until the mixture is smooth and peanut butter is evenly incorporated. After the tofu has baked for 15 minutes, remove from oven. Use half the peanut sauce (2 tablespoons) to glaze/brush the tofu. Then return the tofu to the oven and bake for another 5-7 minutes, or until the edges turn slightly golden brown. Remove tofu from oven, and add it back to the bowl containing the remaining peanut sauce. Toss until tofu is well coated. Put dry noodles in a large heatproof bowl. Pour boiling water into the bowl, until the noodles are completely submerged. Cover the bowl with a plate, then let noodles soak for 3-5 minutes until tender. Strain and rinse with cold water to stop the cooking process. Shake the colander well to allow excess water to strain away. While the noodles are soaking, make the ginger lime vinaigrette. Add all ingredients to a jar and shake well to mix. To assemble your salad, first toss the noodles in half of the ginger lime vinaigrette (1/3 cup). Mix well to ensure the noodles are evenly coated. Divide noodles among bowls. 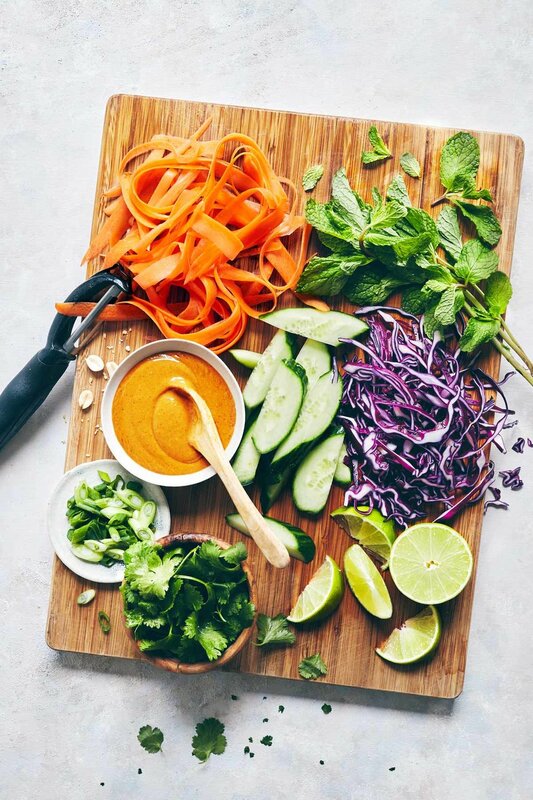 Add carrots, red cabbage, cucumber, lettuce, cilantro, mint and green onions. Drizzle the remaining ginger lime vinaigrette on top of your assembled bowls. Add peanut glazed tofu and sprinkle with chopped peanuts (if using). -*Avoid coconut oil which will solidify when it gets cold. You could substitute grapeseed oil for sunflower seed oil or unrefined peanut oil. -**Asian grocery stores typically stock vermicelli noodles made from rice as well as mung beans. For this recipe, we prefer rice noodles which are slightly firmer. -***To create long strands of carrot pieces (like pictured), use a vegetable peeler and run it down the length of the carrot.